Asian soybean rust, Phakopsora pachyrhizi, is the most devastating disease in the soybean crop. Despite efforts to control the disease, such as a soybean-free period and cultivar resistance, outbreaks have been increasing in Brazil, with losses reaching 80%. Chemical control is the main strategy adopted by South American farmers to control the disease. Fungicide application is recommended before the occurrence of symptoms; monitoring for spores can improve decision-making and treatment applications. 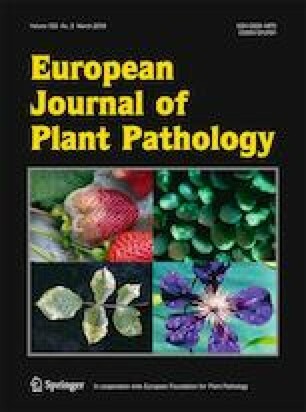 The objective of this study was to identify a spectral signature for the fungus P. pachyrhizi and quantify the number of urediniospores in a sample of water using the Fourier Transform Infrared spectroscopy technique in the MIR range, 650 cm−1 to 4000 cm−1, with the attenuated total reflectance (ATR) accessory. In FTIR spectroscopy, the samples are irradiated by infrared light resulting in absorption of energy by molecular vibrations. Fungus samples were collected in 48 Brazilian soybean growth regions. A total of 130 samples were assessed. The characterization of fungi samples was conducted using Infrared Spectroscopy from 1000 cm−1 to 1560 cm−1. The spectral signature of P. pachyrhizi was between 1500 cm−1 to 1550 cm−1. The quantification showed high values for the calibration coefficients (R2 = 0.9478), cross validation (R2 = 0.9330) and prediction (R2 = 0.9236), which demonstrates the accuracy for estimation of the number of urediniospores. The FTIR-ATR spectroscopy enables the characterization and quantification of P. pachyrhizi urediniospores in water samples, creating a more efficient way to monitor spore dispersal and management of this disease. Levasseur-Garcia, C. (2018). Updated overview of infrared spectroscopy methods for detecting mycotoxins on cereals (corn, wheat, and barley). Toxins, 10(1). https://doi.org/10.3390/toxins10010038.